Philips spent years developing a perfect horticulture lamp line with superior color quality. Their goal was to create the closest spectrum to the sun; crisp, white light. These lamps have a very high 1.95 PPF per second light source. The 3100°K or 4200°K color temperature models have a high 92cri, 33,000 initial lumens (105Lm/W). 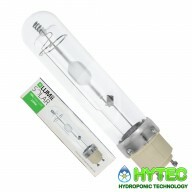 The lamps have a very high 90% lumen maintenance at 8,000 hr/High 85% PPF maintenance at 20,000 hr. 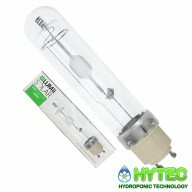 These are extremely unique open rated lamps that have a proprietary design, reducing radiant heat from the arc tube. 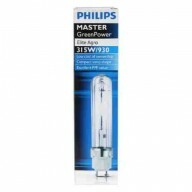 These double jacketed lamps are suitable for open fixture use. The 3100°K is designed for mothering plants, vegging plants, or flowering plants. 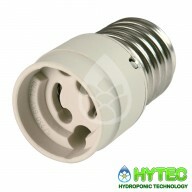 The 3100 lamp has the broadest spectrum and is compatible with any garden application. 4200°K color temperature models provide increased UV making these lamps ideal for those going specifically for essential oil production. This is a perfect lamp for Mothering and Vegging. E40 to 315w cmd Lamp Adapter Do you love using your Maxibright DAYLIGHT 315 but miss using it with your favourite reflector? Well GOOD NEWS those days are over! 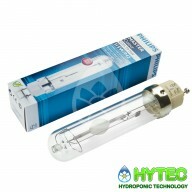 You can now use any HID reflector with an E40 lamp holder with the DAYLIGHT 315 by using the handy E40 Adaptor! 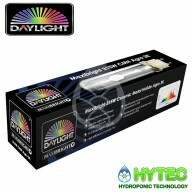 How does it wo..
MAXIBRIGHT DAYLIGHT CMH 315W AGRO BULB Special chemistry powers the new Maxibright 315W 3K Agro Daylight lamp. After fourteen months of development and scores of iterations and long days in the engineering lab the chemistry in the Maxibright 315W Agro and Daylight lamps has been perfected. 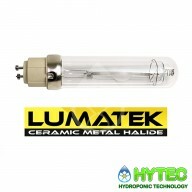 Wh..
LUMATEK 315W FLOWER CDM lamp - 3000K LUMATEK 315w ceramic-discharge metal-halide (CDM) lamps deliver a light spectrum that’s much closer to natural sunlight than typical High Intensity Discharge (HID) systems. They have a low power consumption and heat output and they produce a very..
LUMATEK 315W GROW CDM lamp - 4200K LUMATEK 315w ceramic-discharge metal-halide (CDM) lamps deliver a light spectrum that’s much closer to natural sunlight than typical High Intensity Discharge (HID) systems. These state-of-the art lamps generate a greater level of useable plant light (photosyn..
LUMII SOLAR 315W GRO CDM LAMP - 4200 LUMii SOLAR 315w ceramic-discharge metal-halide (CDM) lamps deliver a light spectrum that’s much closer to natural sunlight than typical High Intensity Discharge (HID) systems. These state-of-the art lamps generate a greater level of useable plant light (ph..
LUMii SOLAR PRO 315W CDM Lamp LUMii SOLAR 315w ceramic-discharge metal-halide (CDM) lamps deliver a light spectrum that’s much closer to natural sunlight than typical High Intensity Discharge (HID) systems. They have a low power consumption and heat output and they produce a very high-qu..
Mastercolor CDM-T Elite 315W T12 CL Agro (grow & flowering stage) The 3200K (33,000 initial lumen) CMH is optimal for all stages of growth from start to finish Features: Prevent stretching Encourage much higher quality growth More natural formation of branc..
PHILIPS MASTERCOLOUR DAYLIGHT CDM-TMW Elite 315W/942 (vegging or grow stage) The medium wattage lighting system that gives superior, longer-lasting white light for both indoor and outdoor use. This bulb gives twice as much growing light as a plasma light. Characteristics: Lu..